14 China, Chinese Imperial Railway, Canton-Kowloon Railway Gold Loan 1907, bond for £100, red & black, with coupons. Creases to top edge VF. (1). 33 China, Imperial Chinese Government 1911 hukuang Railways Gold Loan, bond for £100 issued by J.P.Morgan and American Banks, vignette of speeding train, black & red, with coupons, central fold otherwise VF. (1). 31 China, Lung-Tsing-U-Hai Railway 5% Gold Loan 1913, 16 x bonds for £20, ornate border, blue & green, with coupons, mostly VF. (10). 30 China, Lung-Tsing-U-Hai Railway 5% Gold Loan 1913, 10 x bonds for £20, ornate border, blue & green, with coupons, mostly VF. (10). 4 China, Chinese Government 5% Hukuang Railways Sinking Fund Gold Loan bond 1911 for £20, Banque de L'Indo-Chine issue, large format with steam train at top, printed by Waterlow's with coupons. 5% Reorganisation Gold Loan bond 1913 for £20, Mercury at top, brown, Banque de L'Indo-Chine issue, coupons present but detached. 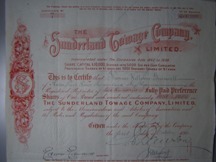 Skoda Loan, bond for £50, ornate border, with red "chop" in centre, with coupons. All three with signs of having been mounted. good F or better. (3). 6 China, Chinese Government 5% Hukuang Railways Sinking Fund Gold Loan bond 1911 for £100, American Banks issue, large format with steam train at top, printed by Waterlow's with coupons. U.S. Tax Stamps at left, central tear at fold otherwise good fine. 34 China, Peking-Hankow Railway Gold Loan of 1911, bond for 1,000 yen, issued by Yokohama Specie Bank, ornate design with dragons at top, black & yellow, with coupons, weakness at central fold, F. (1). 28 China, Lung-Tsing-U-Hai Railway 1913 Gold Loan, 5 x issued bonds with coupon sheets attached. Together with Lung-Tsing-U-Hai Railway 1921 coupon sheets . 10 China, 10 bonds, Vickers Loan, 1919, bond for £100, Marconi Loan, 1918, bond for £100, Emprunt Industriel Loan, 1914, bond for 500 francs, Province de Petchili Loan, 1913, bond for £20, Railway Equipment Loan, 1922, bond for £20, Tientsin-Pukow Railway Loan, 1908, German issue, bonds for £20 and £100, also German Supplementary Loan, 1910, bonds for £20 and £100, plus Reorganisation Gold Loan, 1913, bond for £20, top binding is missing from this bond, all with coupons, mixed condition, mostly F-VF. (10). 32 China, Chinese Imperial Railway Gold Loan, Shanghai-Nanking Railway, 2 x bonds for £100, dated 1904, and bond for £100, dated 1907, large format, black & pink, all with coupons, also 5 x net profit sub-certificates, mostly VF. (8). 38 China, Imperial Chinese Government Hukuang Railways 1911 Gold Loan, bond for £100, issued by J.P. Morgan and American banks, vignette of train, black & red, with coupons, VF. (1). 12 China, 3 bonds, Hukuang Railways 1911 Gold Loan, bond for £100, Hong Kong and Shanghai Bank issue, Railway Equipment Loan of 1922, bond for £20, and Lung-Tsing-U-Hai Railway 1913 Gold Loan, bond for £20, all with coupons, all VF. (3). 33 China, Chinese Imperial Railway Gold Loan, Shanghai-Nanking Railway, bond for £100, dated 1903, large format, black & pink, with coupons. F.
1092 China, Imperial Chinese Government Hukuang Railways 1911 Gold Loan, 5 x bonds for £100, all issued by the Hong Kong and Shanghai Bank, vignette of speeding train, red & black, all with coupons, mostly VF. (5). 1093 China, Imperial Chinese Government Hukuang Railways 1911 Gold Loan, 5 x bonds for £100, all issued by the Hong Kong and Shanghai Bank, vignette of speeding train, red & black, all with coupons, mostly VF. (5). 1091 China, Imperial Chinese Government Hukuang Railways 1911 Gold Loan, 5 x bonds for £100, all issued by the Deutsch-Asiatische Bank, vignette of speeding train, red & black, one without coupons, mostly VF. (5). 1081 China, Emprunt Industriel du Gouvernment de la Republic Chinoise 1914 Gold Loan, 10 x bonds for 500 francs, ornate border incorporating railway scenes, black & brown, with coupons, mostly F-VF. (10). 1090 China, Imperial Chinese Government Hukuang Railways 1911 Gold Loan, 3 x bonds for £100, all issued by the Deutsch-Asiatische Bank, vignette of speeding train, red & black, with coupons, mostly VF. (3). 1082 China, Government of the Chinese Republic 1913 Gold Loan for the Lung-Tsing-U-Hai Railway, 11 x issued bonds for £20, and 3 x unissued bonds for £20, ornate border, large format, black & blue, there are no coupons with the unissued bonds, mostly F-VF. (14).